By April 18, 1775, the Sons of Liberty were in quite the quandary. British soldiers were traveling the countryside confiscating the colonists’ weapons, so they needed a way to alert the Minutemen that their arrival was imminent, giving them time to hide their firearms. Dr. Joseph Warren approached Paul Revere and William Dawes, informing them that General Gage planned to march on Lexington and Concord, and the militia in the area needed to be alerted. Dawes was specifically tasked with informing John Hancock and Samuel Adams that they were in danger of being arrested. Revere and Dawes couldn’t just sashay out of Boston and deliver their messages. The city exits were heavily guarded, and anyone out and about after nightfall could be arrested on the spot. If both Revere and Dawes got caught, they were screwed, and Revere knew it. He also knew just the guy to help him devise the perfect back-up plan. Captain John Pulling had been Revere’s best friend since childhood, and as adults they were business associates and members of Boston’s Committee of Correspondence, an organization that gathered intelligence on and tracked the movements of the British troops in the American colonies. Pulling was also a vestryman, or elder, at Christ Church (better known as the Old North Church,) which was really going to come in handy. His old buddy Revere asked him a huge favor – would he be willing to risk his life by hanging signal lanterns from the steeple of the church? The answer was, of course, a no-brainer. Earlier that day, Pulling and several other passionately patriotic vestrymen gave their Loyalist rector the boot for preaching against their revolutionary cause. John Pulling was hoping that if caught in the church after dark, his “management” position would explain his being there that evening. They also enlisted the help of a man named Robert Newman, who had recently taken the job of sexton (similar to a janitor) at Christ Church and was none to happy about it, but could find no other work. He had not been active in the revolutionary cause up to that point, but seemed eager to help. Most importantly, he held the keys to the church. One if by land and two if by water. Captain Pulling hung two lanterns from the north windows facing Charlestown for just shy of a minute, hoping to avoid catching the attention of the British soldiers. The message was seen by patriots in Charlestown, and then it was passed to dozens of towns by Revere and Dawes, and in turn the message was spread further by others alerting their countrymen from horseback, or by ringing church bells, firing warning shots, or beating drums. Unfortunately, the lanterns were also seen by the British soldiers, who first went to Robert Newman’s house located across the street from Christ Church. Newman proclaimed his innocence and immediately ratted out Captain Pulling. He was released, and a manhunt for Pulling began immediately. At first, Pulling eluded capture by hiding in a wine cask at his mother’s house, and then he stealthily made his way to Boston Harbor disguised as a fisherman, where he boarded a small skiff. The boat was challenged by a British warship but was allowed to pass, and Captain Pulling eventually ended up ashore south of Boston at Nantasket Beach in Hull, MA. His wife Sarah managed to escape Boston to reunite with her husband, and they lived in exile in Cohasset, MA. Pulling was a hunted man until the British troops evacuated the city of Boston on March 17, 1776. Even though they lost everything they had, Pulling resumed working for revolutionary causes when they returned to Boston, but the years of dodging the British took its toll, and Captain Pulling died in 1787 at the age of 50. Even history wasn’t all that kind to Captain Pulling, as some have credited Robert Newman, the snitch who forced him into exile, with lighting the lanterns in Old North Church, but simple logic would dictate otherwise. Captain Pulling was a well-respected businessman, a vestryman, a member of Boston’s Committee of Correspondence, an associate of Dr. Joseph Warren, John Hancock, William Dawes, and lifelong friend of Paul Revere. It is highly unlikely that Revere would trust a janitor he barely knew to undertake a task of such importance. In fact, if Newman wasn’t in possession of the keys to Christ Church, it’s highly doubtful he would have been involved in any capacity. Some accounts claim that Captain Pulling went to Newman’s home to retrieve the keys and he wasn’t present at the church at all that night, which is also quite probable. Captain Pulling is one of the unsung heroes of the American Revolution. Paul Revere never made it to Lexington until the battle had already started. Ditto for William Dawes. 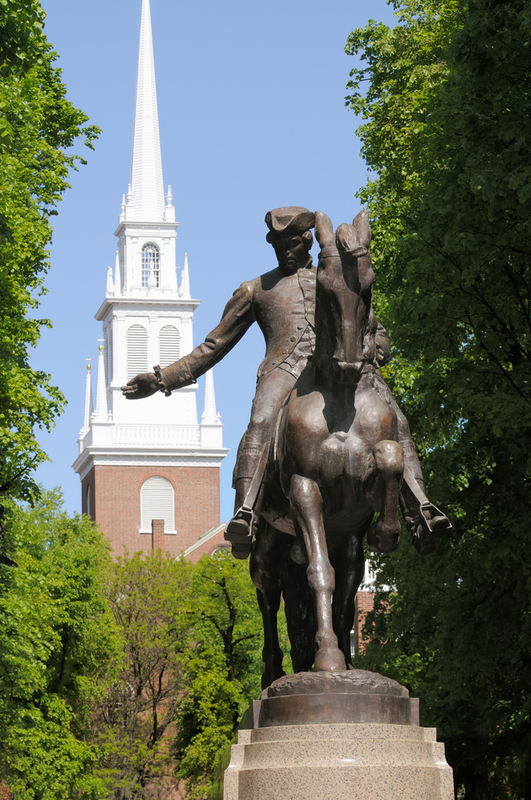 The reason that the message warning of the approaching British reached Lexington was thanks to the many other riders who saw those two lanterns shining from the steeple of Old North Church, and the bravery of the man who dared to hang them. It is not appropriate, in an essay, to use United States Postal Service [USPS] abbreviations (such as “MA”). The full name of the state, Massachusetts, should have been used. This is true even in essays that are less formal than the one on this page. The USPS codes were intended for use only in addressing mail, not for use in sentences within written compositions. People who write for “Today I Found Out” should always keep in mind that there are many very young people and many non-Americans reading here — people who have no idea what “MA” stands for. Writers should take pity on these readers by using full words instead of abbreviations and by using standard English terms instead of potentially mystifying slang. What is most important is to communicate and to inform, not to entertain or to appear stylish.